Howard’s talents evidenced themselves early in his career, beginning with a highly successful performance in Moot Court at the University of Wisconsin Law School. 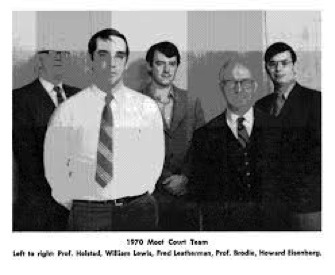 The picture below recently resurfaced on the Internet and shows Howard’s championship moot court team from 1970. Howard is the individual on the far right of the photo. A fuller description of Dean Eisenberg’s career can be found here. MULS Dean Howard Eisenberg was not only a master appellate lawyer but one of the finest people I ever met. Thank you for helping to keep his memory alive, Gordon!